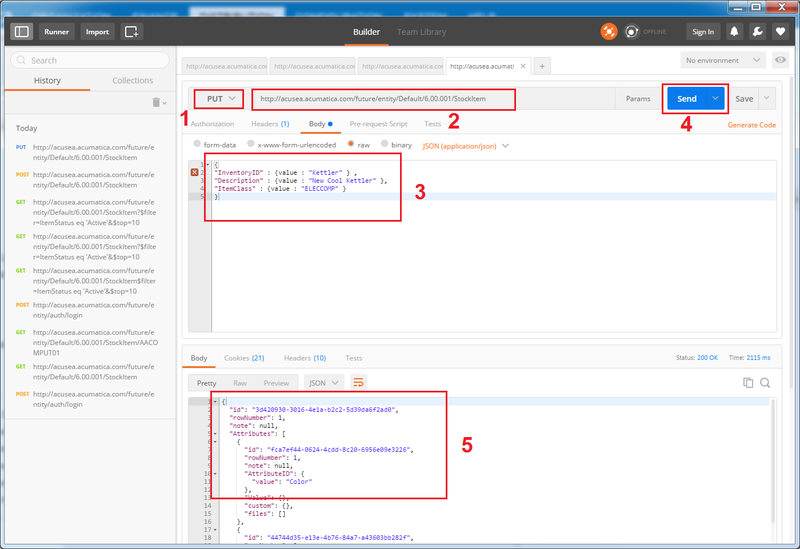 With Acumatica 6 release you can find (and actually use) new type of API – Rest API. Field and container is available for REST API only if it is defined in contract. But you may extend existing contracts. 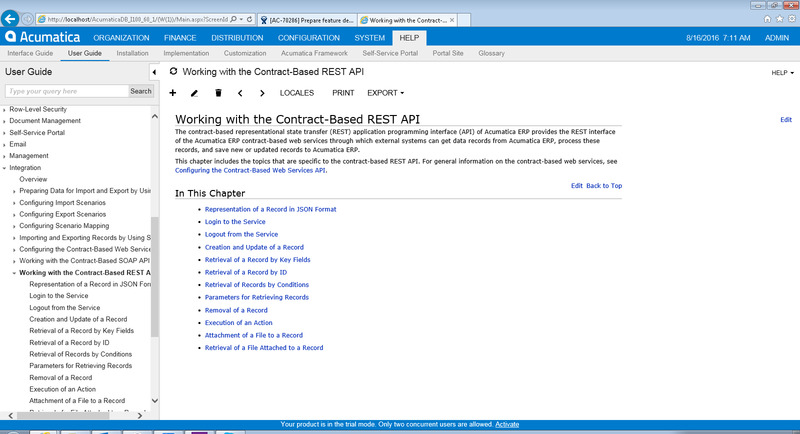 With REST API you have the same set of commands that you have with Contract Based API. You still have to maintain session and authentication cookies. Ok, lest try to do some examples. Here I will show you how to call Acumatica REST commands from Browser. By using this approach you can easily test functionality and just feel, how does it work. To do so, we need a special tool. I will use PostMan extension for Google Chrome browser. 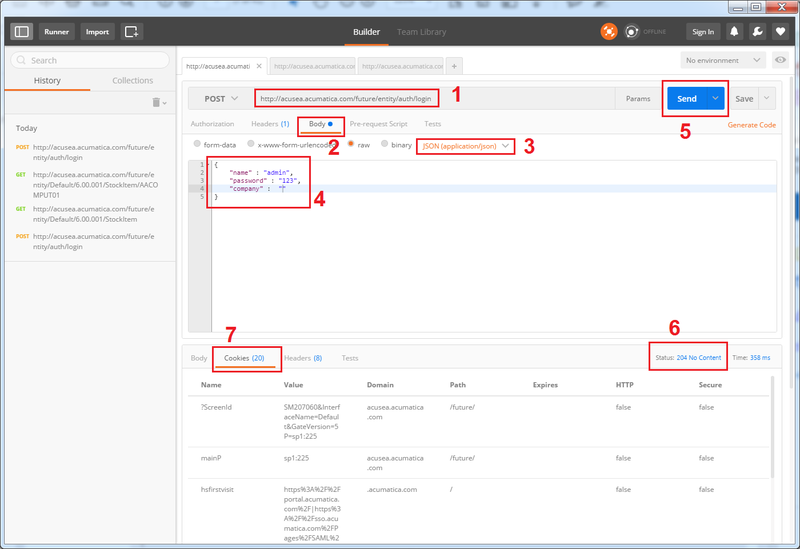 As we need to maintain session and cookies between calls, we also need to install Postman Interceptor extension. Response should be 204 No Content. Ok, authentication is done, lets try to select data. You also can create new entity using REST API, in this case you need to use PUT method and send item details using JSON format. Name of the fields and containers you can get from Contract definition. Good news that the documentation on the REST API is included right within standard Acumatica Help. There you can find multiple examples and good code snippets that you can use from your favorite language/platform/code. Thanks for the article, could you provide an example using an action? I am looking to relate two entities specifically a customer and contacts I thought It would be as easy as passing in an array of contact ids but errors saying fields cannot be empty but everything already exists I just want to relate the objects. Would I do this through an action? How do I get a list of all the actions? How come sometimes it says that x is not defined in the dictionary ? Can I get a list of things that are defined in the each dictionary? I’m not sure if I got your question correctly, but if you want to attach new contact to customer, you should work thought screen – contacts and than specify there BAccount. Than Contact will be linked to customer. If you mean something else, please give me more details about command you use and exact error message with stack trace. How do you pass the filter? Your example has spaces in it? I'm trying to work with the REST APIs using PHP cURL code. I'm testing by doing to calls in Postman: Login, Create a Customer. It works fine. I'm thinking that Postman automatically passes the session information between calls. Do you know how to get the PHP cURL code that will pass the cookie information between API calls? Nevermind on this. I was able to get it to work. I just had to figure out how to pass cookies between the requests. I couldn't figure out though how to post my successful PHP code sample here in the comments so I created a post on my blog instead. I am trying to use the action Prepare Invoice for a sales order with the instructions from your post dating 26th January. I can't get it to work, do you think it is possible to do it for this action ? I needed to add the PrepareInvoice action in web service endpoint SalesOrder. Thank you for confirmation. Ans sorry fore late replay, that is due to time-zones. Could you give an example of how the expand parameter can be used? Expand should add details records to result. In Expand you should pass name of container that exists in Acumatica Contract Endpoint. Yes, you can but you need to put custom fields in a special collection. Can you tell me how to use date filter while fetching items. The filter mentioned in the documentation doesn't seem to work. Try using no filters to find out the date field name for the specific object(endpoint) you are looking for. For example, the StockItem endpoint gives information about the items that are on stock. It has a field 'LastModified' that accepts date values as filters. Here is how the filter can be applied. This URI would fetch all stock items that are in a status of 'Active' and modified after 01-OCT-2017. One more thing, can you please tell me how to fetch product price through API and add multiple addresses to a customer in POST request. I did think the best way to fetch a product price would be to use the endpoint for products(NonStockItem or StockItem I think) and then use the response JSON to extract the relevant information (in this case the price as you want it) from it. As for the multiple addresses, I think these multiple addresses would need to be added as a JSON array onto the corresponding linked entity. I have not tried it myself though. NonStockItem or StockItem are not the best place for price, as price may be different per customer/class/item/promotion and so on. Hi, how do I select a value from a selector based on some condition? I'm creating an Inventory Adjustment transaction and I need to select a ReceiptNbr to associate with the adjustment transaction. I need to select the oldest receipt with a non zero qty. on hand from the selector. How do I perform this? Can you provide an example? Thank you. I do not think you can do this in one request. I suggest you get oldest receipt from receipts screen or generic inquiries and than create a adjustment with second request. I created a Production Order using the REST api in Postman. Now I need to release this production order. "Error reading JObject from JsonReader. Current JsonReader item is not an object: Null. Path 'parameters', line 3, position 22." Any idea on why I am getting this message ? I see that you miss the second key of Production Order – OrderType. When you pass entity you need to pass all keys to find it. Also make sure that your action is defined in the contract. I tried passing the OrderType as well. I tried using ProductionNbr as well as the DB field name ProdOrdID. 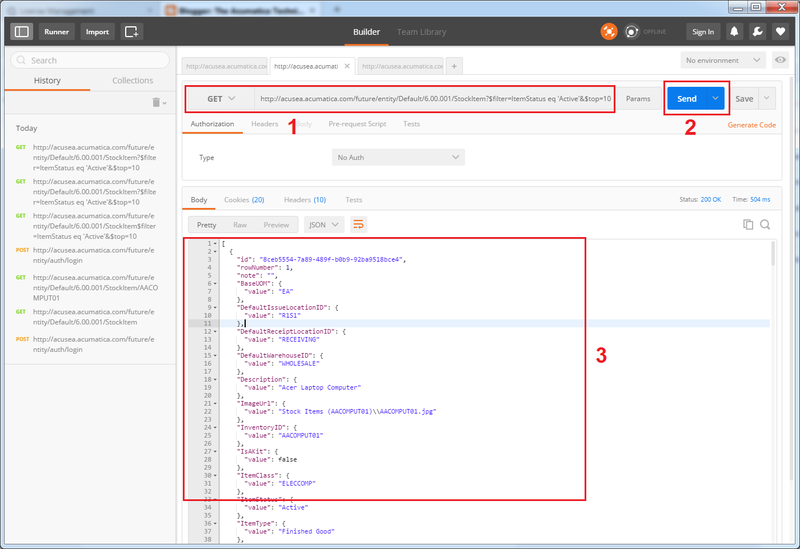 The Action is defined in the web services endpoint ProductionOrder > Actions > ReleaseProductionOrder. I'm really sorry for long reply. Could you please create a case with Acumatica team? It looks that we need to investigate your problem. Thank you! Hi, where can I find a list of all the top-level entities that can be retrieved through the api? You should be able to get the list of available endpoints and its fields on the menu "System" >> "Integration" >> "Web Service Endpoints". Hi, How can I update the lines on a Shipment, such as the LotSerialNumber? do I need to supply a specific row number? Or you can create shipment from shipment screen and link it with sales order. In second case you need to have 2 calls. I was referring to how use the rest api. I am using postman and I have been unable to submit a value to the detail array. One of the issues you have is "Inventory" -it should be "InventoryID"
But if that does not help, please connect me by skype and we can discuss it there. I'll need an error message. The InventoryID does not work either. I am trying to update the shipping lines (Lot Serial Numbers) via a put method, but it seems that the api method only attempts to add new line. is there some kind of identifier (like the @@ in import scenarios) so I can uniquely identify a specific shipping line. What would be the best way to message you, so I can give you my skype info? Nick, sorry for later reply. Id can be obtained from "ID" field when you retrieve records. To contact me please message me in linkedin or thought google hangouts. For security reasons I do not want to publish my skype on blog. When sending a request fetch details for a specific StockItem is it possible for the response to include information on the ItemSalesCategory records a item is associated with? I reviewed the StockItem schema, but was unable to locate a reference to the associated ItemSalesCategory fields. I did find a method to retrieve the information by making a second request using a filter on ItemSalesCategory, but it would help reduce the number of calls required to integrate each StockItem if there was a method to include these details with the existing information for a StockItem. I am trying to find if there is a problem with the REST API endpoints starting with 6.00.001. This has been happening for the past couple of days. The usual SalesOrder endpoint I have been using in the past is now rendering a “Object reference not set to an instance of an object”. Any clues why this is happening? Hi Lakki, as far as I know there are many customers who are using REST API 6.00. And NullReferenceException may be a reason of many things including Sales Order itself. Could you please provide a bit more details? – Stack Trace, code? How to post sales order using API through Postman? I create an endpoint for SM200530 and try to upload attachment file through rest API. Please note that DAC of this screen does not have CD column. Therefore the uri of api as below. I figured out myself. I passed the wrong key. I have created a new REST API endpoint. Now, I want to deploy it to 200 sites of my clients. How can I achieve that? There was a post from Acumatica stackoverflow said that the API migration can be done through customization package. However, in my situation it is very troublesome to manually apply customization for 200 sites. Hi Vo, this is correct that you need to use Customization Packages. But to automate publications on 200 sites, you can use the special services for customization maintenance. I try to create execution action endpoint for Certificate Replacement (SM200535). It returns 202 (accepted). However instead of replacing new certificate, Acumatica reset to default certificate which is empty current certificate. Unfortunately I can’t answer this from top of my head and need to debug code first. I’ll try to do this as soon as I have some time. But it may be faster if you create a supprot case, so our services team can check your code faster. I try to get list of tenants per site. It gives me error. Please assist. however, if I try to put in CompanyID, it returns expected data. Hi, How can I update the items on a sales order record through REST API, such as the quantity, discount? do I need to supply a specific row number? If i’m trying to update its creating a new line but that’s not i need, it should be update based on inventory id. please help me out. User “id” property to specify line key. You can select it first, than use it. Thanks Its working fine, can we check specific item is there or not in the Sales order using filter operation, because its not easy to fetch the item id in the salesorder to update it. Checking item by InventoryId is not always correct as you may have multiple lines with the same inventory item in the SO. 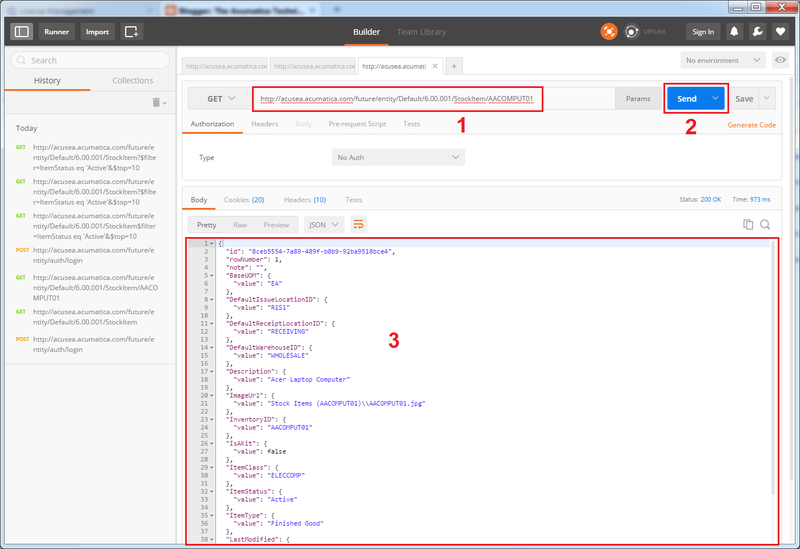 In this step, the invoice is created in AcumaticaERP but the response is empty with a 202 Accepted status(in Postman). Is there a way to retrieve the newly generated invoice reference number from this request. When you release invoice you get back the ID. Use this Id to get record back later. Also monitor the status to get confirmation that record is processed. I have created a new form through customization, how can I fetch / push data through rest endpoints for the custom fields? Yes API is available for custom forms either. You just need to add this form to your endpoint. 1. Created an adhoc SQL query and published it to the Acumatica server as a view. 2. Created a DAC and Generic Inquiry from that published view. It returns data. 3. Created a Contract 3 Web Service Endpoint. The GI returns many records. Postman REST PUT test returns one record. Why? I have added IsKey to all of the foreign fields in the DAC. I need the TaxSchedule detail property polulated, I will not be using the Zones property. So how can I request the Tax and TaxSchedule? Spoke too soon, I just discovered the XXReturn classes. All is good! Could you please post here your request? JSON object is fine. What are you sending to Acumatica? Im trying to access the field of object in Web Service Endpoint using another object, is that possible ? Hi Leomil. What do you mean under other object? Does it means that you want to get Customer Email using Sales Orders entity? If yes, than it is not possible. All fields are linked to particular screens and can be accessed only from there. Is there a way to create new rest API endpoint without specify Screen ID? We have an extension DAC (xxCompany) of Company. We’d like to insert/update xxCompany through API without creating new or update existing screen. Unfortunately no. The reason is that only Graph knows how to properly save the data and graph is 1to1 linked with page. Plus Acumatica gets sequence of data import from screen. So currently Graph and Page are mandatory for entities in the endpoint. I have 3 tenants in one instance and I am using the rest API. I am trying to figure out how we can pass the tenantid in the login endpoint. /entity/auth/login. The call looks to be defaulted to the first tenant that we created . My confusion is that we have 3 tenants and the same companies exist in all the tenants. Is there some special code I need to reference in the API call to make sure that the correct tenant and company is used. Hi Derek, I think confusion here comes from naming. Company in this login refers Tenant. This is old naming that we had in the past. So when you choose Company you actually choose tenant. Branch will be the name of company or branch. Perfect, that clarifies a lot. I want to create REST API but i did not getting webservices for contract based REST API can you help me regarding this? Hi Sanpro, go to Acumatica, open Web Services Endpoint, select default. Than use use button “View Endpoint Service” and then OpenAPI 2.0. This is definition for REST API you can consume in 3rd party product. How to find entity version of end point webservice in CB based REST API? As an administrator search ‘Web Service Endpoints’ in Acumatica. When you are on the screen select which endpoint you are looking for. As an Example ‘Customer’. In the summary top area, you can select the magnify glass and see all the support versions. Here is an active endpoint /entity/default/18.200.001/customer. I am looking to create a customer using the REST API and have not been successful. Can someone share the payload or article they are using to create a customer? I found the problem that was causing my issues with creating a customer, the endpoint is case sensitive. I was submitting to /entity/default/18.200.001/customer where I should be submitting to this /entity/Default/18.200.001/Customer. The above request is failing for me though. The requirement is to retrieve all details of Sales Order from GET Shipment endpoint. I’m trying to create a Customer using the REST API. I’ve extended the default endpoint and added 2 fields that are required but when posting, it created an Address record with a BAccountID -2147483647 and didn’t create the Customer. From the first look your script looks OK. But if there is a record create with negative id, it looks like an internal problem. I recommend you to use Request Profiller and try to get an internal errors (if any) from there. I guess there is something that is not displayed. However the query looks very busy, could there be another way to get the Shipping Address from Sales order? But when I retrieve the SO then ShipToAddress is not retrieved. How can I access this element and avoid the custom queries. Could you please try this way? I want to attach a file to sales order line items using web service end point. What should be the endpoint for same? I have checked the link provided by you. I want to attach a file to sales order Details line item. For that what endpoint should i use? Like i have detail item with Inventory Id as P123. I want to attach a file to this line item. How should i generate the endpoint for adding a file to line item? Hi Anshu, I’m really sorry, but attach file to details can be done only in Screen Based API for now. We might improve it later, but for now it is not possible. Hi all can you help me? I need to export Ap bills with details. When I use Bill entity everthing ok. buy I got error when I tried to use Detail etity by expand param. error: “message”:”An error has occurred.”,”exceptionMessage”:”Optimization cannot be performed.The following fields cause the error:\r\nDetails.Account: View Transactions has BQL delegate\r\nDetails.ProjectTask: View Transactions has BQL delegate\r\nDetails.Qty: View Transactions has BQL delegate\r\nDetails.Subaccount: View Transactions has BQL delegate\r\nDetails.TaxCategory: View Transactions has BQL delegate\r\nDetails.TransactionDescription: View Transactions has BQL delegate\r\nDetails.UnitCost: View Transactions has BQL delegate\r\nDetails.UOM: View Transactions has BQL delegate\r\nDetails.Amount: View Transactions has BQL delegate\r\nDetails.Branch: View Transactions has BQL delegate\r\nDetails.Description: View Transactions has BQL delegate\r\nDetails.ExtendedCost: View Transactions has BQL delegate\r\nDetails.NonBillable: View Transactions has BQL delegate\r\nDetails.POOrderNbr: View Transactions has BQL delegate\r\nDetails.POOrderType: View Transactions has BQL delegate\r\nDetails.Project: View Transactions has BQL delegate\r\n”,”exceptionType”:”PX.Api.ContractBased.OptimizedExport.CannotOptimizeException”,”stackTrace”:” at PX.Api.ContractBased.Optimize. – Call for keys only for all bills you need. This is in bulk in one request. – Than retrieve records by keys. This is one by one. Unfortunately you can’t get details in bulk with headers due to performance impact it is blocked. thank you for your reply but if key field is not present in the detail entity should I expand old Entity and add it? So when you get document by keys, you can get details. I want to sync our order data to our Acumatica ERP. Also, I found some difficulty for adding the field to Acumatica endpoint, Can you please guide? Can you please guide me how can I sync order data to the AcumaticaERP with PHP CURL. Thank you for the sharing the url. I am able to successfully sync the customer. I would like to sync the Order with Rest PHP curl. Please use T410 training course that will explain you how to use Acumatica REST API. It also contains some examples. I will check the training course and get back to you.